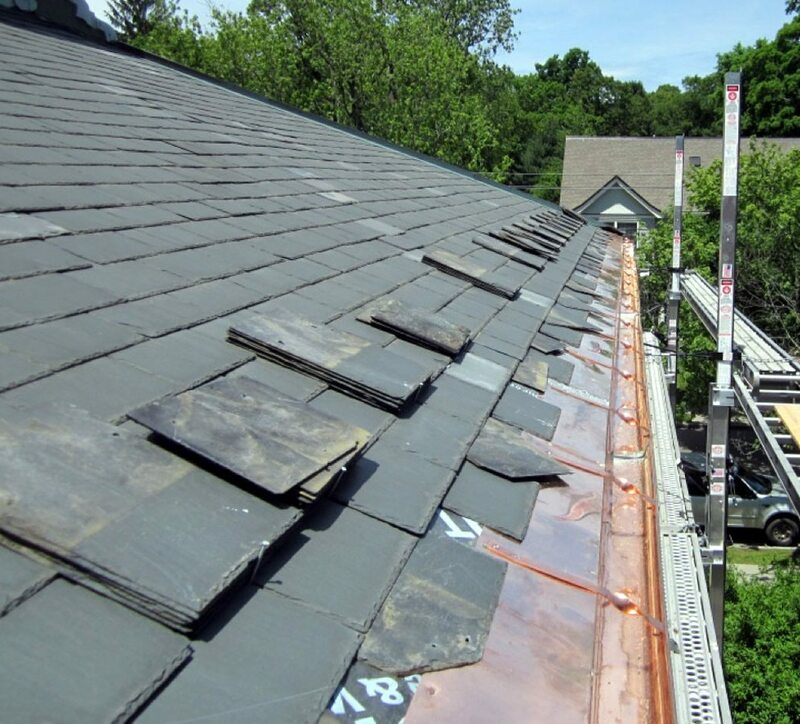 For years it was very common to see wood gutters being installed on a slate roof. Nowadays quality wood gutters cannot be found. The wood gutters that have been produced over the last ten to fifteen years do not hold up because they are making lumber products out of quick growth trees that are only 15-20 years old. The growth rings are still sap wood and let moisture into the grain of the wood causing rot and or splits in the grain of the wood. The old growth trees have tighter growth rings resulting in a much denser piece of lumber resisting rot and decay. When it comes to slate roofs aluminum gutters are not the answer either as the snow slides from the slate roof are likely to damage or tear off the aluminum gutter. We install custom formed copper gutters. 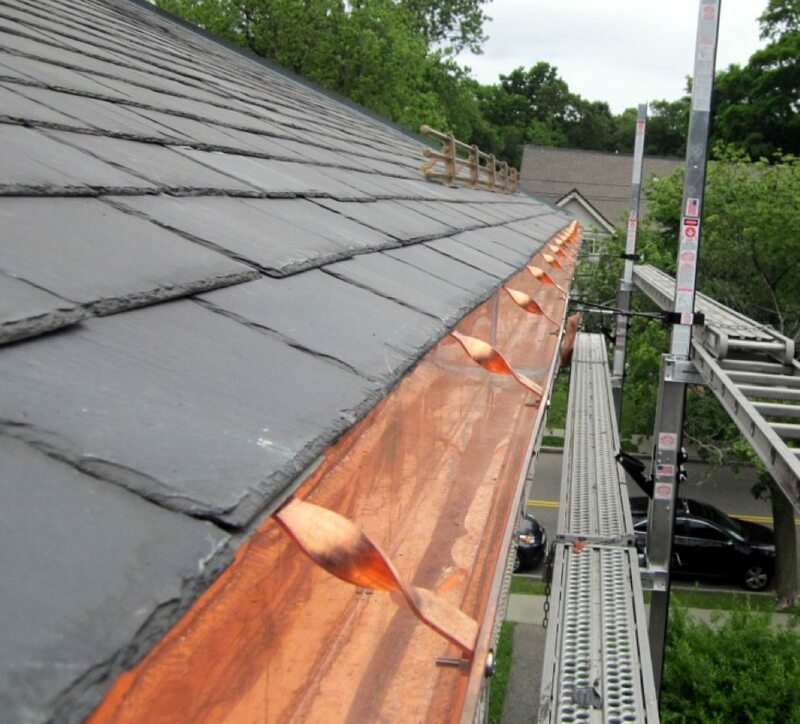 The copper gutter system that we install can withstand the snow slides and extends up onto the roof deck making it a seamless transition from the roof deck to the gutter (no water can go behind the gutter). We first remove the slates from the edge of the roof. Then we apply Grace Ultra (high temperature) ice and water shield to all exposed roof boards. We then install the new custom formed copper gutters. The gutters have a continuous reinforcing copper bar one inch wide one eighth inch thick that runs through the front rail of the gutter. The gutter extends up on to the roof deck and is fastened with two-inch copper clips. We then install custom formed brackets that are one-eighth by one-inch copper bars bolted to the front rail of the gutter and lagged to the roof deck. Copper bars have a twist in the middle to help absorb the shock from snow slide and so water running over the bar will fall into the gutter. All seams, end caps, and outlets are then cleaned soldered and cleaned again. The slates are then reinstalled to the roof edge.